The junction of the Mike Turtur shared path and Musgrave Street @ Goodwood has been revamped giving better line of sight and improved safety for pedestrians and cyclists. It works well if the cyclists and the pedestrians follow the path and the signs painted on the path. most cyclists just went wherever they wanted: whichever was the shortest route. They are still cutting across the driveway and putting themselves at risk. most pedestrians and joggers did the right thing, but some (a few) also cut across the driveway. What is really needed is a hump or some physical barrier along the edge of the bricked driveway. Full marks to the local resident who has planted the area. It's good to see residents planting and maintaining the verges in their street. Many thanks to the cyclists and pedestrians who have provided me feedback on what works and what doesn't work. I've taken that on-board. That was a lot of work to separate the walkers from the cyclists. But now the cyclists still cut across the driveway. They are a law unto themselves. To be fair, a few courteously do the right thing. As a cyclist it concerns me to see other cyclists do the wrong thing. They just need to slow down a bit and show respect to the others on the path. I agree with you Julie. 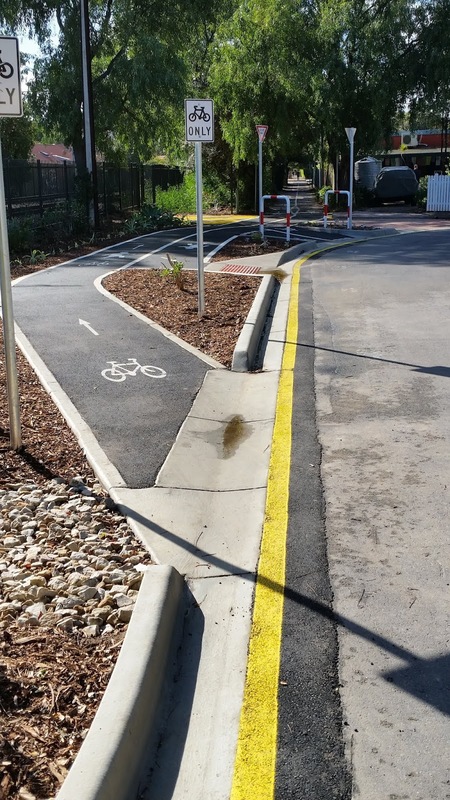 These shared paths shouldn't be speed ways. Hey Bob thanks for getting this work done.